We arrived in Krakow one lovely sunny Thursday afternoon in September. At the airport, prior to our departure from Gothenburg, we were told at check-in that our reservation had been cancelled. Abbu, of course, panicked. But Air Berlin sorted it all out and we were on our way. We had a short flight to Berlin, followed by a one hour layover and another quick flight to Krakow. We landed on a gorgeous bright afternoon. The driver from our hotel was waiting for us. He spoke excellent English and looked like a hipster from Brooklyn. As we drove through the suburbs of Krakow, our initial impressions were of fairly typical suburbia. As soon as we entered the city center, the architecture appeared much older and somehow grittier. The impression was of an authentic and living city that had not been spiffed up for tourists. We arrived at our hotel- The Grand Ascot hotel. It was one of the last hotels that had available rooms for our travel dates. I had my misgivings, but the hotel turned out to be quite excellent. It was smallish- located very close to the main square, but away from the touristy hustle bustle. The rooms were large and well designed. At drop-off, we realized that the driver did not accept Euros. Zloty was the name of the game. We dropped off Ammi and Abbu, and then drove around looking for a money exchange. We found one, exchanged the money, paid the driver and hurried back to the hotel. We checked in, and on the recommendation of the hotel, went to a restaurant right across from the hotel. They had a large sun-dappled courtyard where we had a good lunch. The food was light and healthy-ish. But the best part was the ambiance. We were all instantly in a happier mood. After the long leisurely lunch, we went over to check out Ammi, Abbu's room. The view from their room was of beautiful old buildings. Abbu went into full on paprazzi mode and took about a hundred images in 30 seconds. They wanted to rest, so Noor and I headed over to the main square. It was a 10 minute walk along interesting streets full of coffee shops, bodegas, and locals going about their business. The main square- which dates from the 13th century- is quite stunning -perhaps most because of its massive size; it is considered to be the largest square in Europe. The buildings are fairly typical of Eastern European cities- and very pretty. The sheer size of the square makes it hard to take the entirety in immediately. You have to look at it piece by piece. In the square is a town hall tower, several palaces, three churches, and, in the center, the enormous Cloth Hall, which originally in the 13th century was a covered market, and today is a two-story stone structure that houses dozens of vendor stalls on the ground floor and the Gallery of Polish Art upstairs. It was noticeable how many locals were milling about in the square- it was not all a touristy affair. In contrast to other Polish cities- most notably Warsaw-Krakow was spared destruction in WWII and it is apparent in the appearance of the buildings. The magnificent St. Mary’s Basilica, its crowning glory being Veit Stoss’ altarpiece, is quite the church. Every hour, a bugle call is played from the tower. According to reliable sources i.e. Wikipedia "The plaintive tune breaks off in mid-stream, to commemorate the famous 13th century trumpeter, who was shot in the throat while sounding the alarm before the Mongol attack on the city". The area surrounding the Basilica was formerly a cemetery, and the bodies of hundreds of Cracovians still lie beneath the cobbles. Such morbid musings aside, we did get to see the famous altarpiece. In 1941, during the German occupation, the dismantled altarpiece was shipped to the Third Reich on the order of the Nazis. It was recovered in 1946 in Bavaria, hidden in the basement of the heavily bombed Nuremberg Castle. The High Altar underwent major restoration work in Poland and was put back in its place at the Basilica 10 years later. It is visually arresting and the unveiling is quite the ceremony with a nun making a short announcement beforehand. 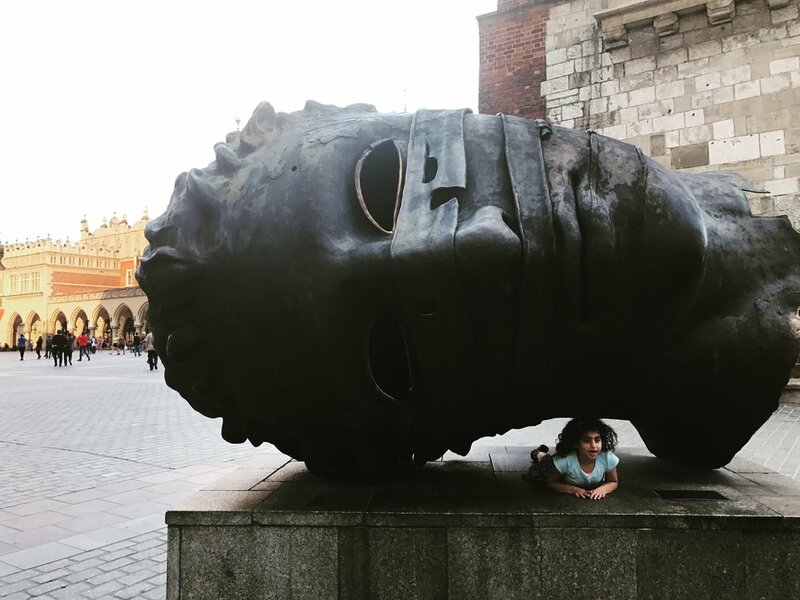 In the square, Noor had a ball clambering around the famous head sculpture, also known as Eros Bound" ("Eros spetany") by Igor Mitoraj, and running around with other kids playing with the soap bubbles . The evening light - and the way it reflected off the facades of the buildings-was absolutely stunning. I could not do a detailed walk around the square because I had to keep an eye on Noor. But I did manage to take quite a bit in. We walked back to the hotel as dusk settled in. On the way back, Noor started complaining of not feeling well. I brushed it off as just whining. We also got lost on the way back which led to a few moments of panic. Back in the hotel, we all wanted to have an early night. However Noor had a full blown fever by then. I had no Ibuprofen so I called downstairs and they directed me to a pharmacy. By that time, it was raining cats and dogs. 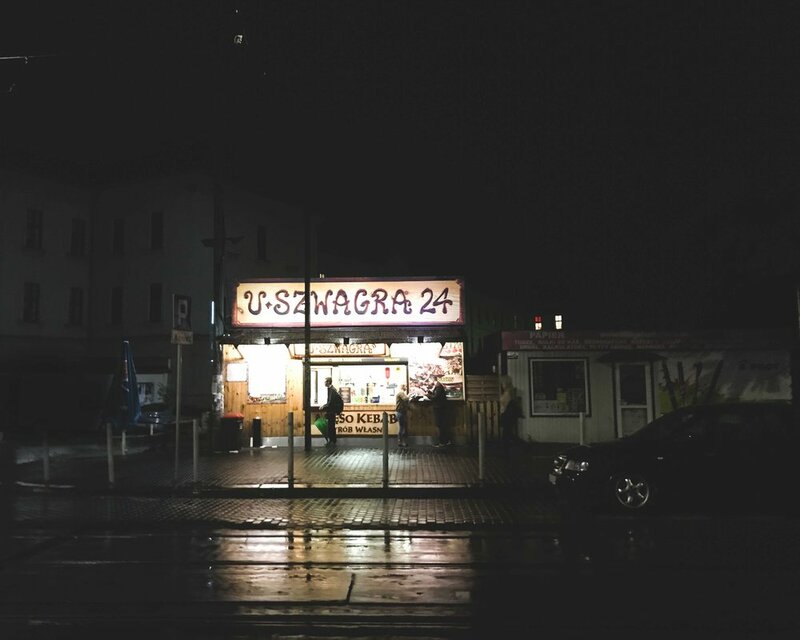 I made my way to a pharmacy-across tram lines, crossing courtyards and little alleys. The pharmacy was like a store from the 1950s, complete with a creaking polished wooden swing door. There was a pharmacist behind an equally polished counter. She helped me with the Polish translation of ibuprofen. To me, this whole episode, Noor's fever notwithstanding, seemed like a little adventure; the rain, the tram lines , the architecture, and the dark courtyards contributed to that feeling. The next morning, we had breakfast at the hotel, parked Noor with Abbu in his hotel room, and Ammi and I took off to explore the square. We walked around and went into the aforementioned church. We walked in right when they were unveiling the altarpiece. A nun announced on a mike that we could not use flash. The unveiling is ticketed, but we ended up seeing the whole thing without a ticket. The altar piece is very intricate and detailed, and worth a look. After the spiritual, we went for the material i.e. Zara next door. It was much cheaper than Sweden, so I bought a few things for Noor. We walked around some more afterwards, and then hurried back because Nayyar was expected to reach Krakow in the afternoon. After Nayyar's arrival, we joined Ammi Abbu for lunch at another local restaurant across the hotel. It is was casual, packed and very very local. We had a most excellent lunch of sandwiches, and then I headed out to meet my guide for a photography walk. I had found David on the internet and he seemed experienced and had very good reviews on trip advisor. I met him in a cafe in the main square. The cafe itself was old world (plated glass, beat up bar, brass, tiled floors ....the whole deal). We sat down for an introduction, and I quickly realized that my knowledge about cameras and photography was at par with his, if not more. I also realized that I may not end up getting the kind of tour that I specifically wanted but decided to go with the flow. I think my guide had the same feeling. We started off by walking around the square where I took some shots of the standard issue soap bubble man. My guide, David, showed me some other framing shots of the square. I- ever the pleaser- obliged him by taking all the shots he suggested. We walked around to the famous Jagiellonian University, which is very close to the main square. I was shown the square where the faculty was gathered after the invasion of Poland, and summarily arrested and marched off to concentration camps. During my entire all too brief stay in Krakow, I felt that history really had a hold on the city. Almost every Pole we talked to had some anecdote about the Soviets or WWII. My guide, a Scot married to a Polish woman, was very knowledgeable about the history of the city. After a while, we stopped pretending to take pictures, and just walked around and talked. It was interesting to hear his perspective about the Polish take on immigration and multiculturalism. We had a short break at Jubilee hotel where we had coffee on the terrace. The hotel was again steeped in another era. One saw old ladies, families and elderly couples enjoying their afternoon drinks. The decor was art deco. I wanted to take pictures inside but felt that it would be an intrusion so resisted. Afterwards we explored the Jewish District of Kazimierz. Dusk was falling so we walked quickly so as to take in as much as we could. Again David had lots of stories and information about the place. He showed me the passage where an unforgettable scene ( where the Nazis throw an old man in a wheelchair off a balcony) from Schindler's list was filmed. There was an outdoor cafe right next door with loud music playing. It somehow seemed blasphemous. There were several homes that appeared unoccupied. I was told that these homes were under the " right of return" law i.e. if the descendants of the jewish families who lived here before the war, ever claimed the homes, these will be returned to them. Hence no one touched these properties. The entire district is filled with quirky shops, cafes, and shabby chic spaces. Some of the cafes we stepped into were the exact same spaces they had been when they first opened decades ago- complete with candlelight and all. I could tell that Kazimierz demanded a more detailed tour. I did get some photos in the failing light, but not as much as I would have liked. The place was atmospheric and moody and I just could not capture the mood adequately. At the back of mind was the fact that I needed to get back to Noor who was still not that well. I told David that we will have to wrap up the tour soon. He hurried me through some other sites, crossed the Vistula, walked through the chairs installation, which is also called the Ghetto Heroes Square with its 33 memorial chairs made of cast iron and bronze. The chairs symbolize the tragedy of the Krakow Jews who were imprisoned in the Krakow Ghetto during the German occupation of Poland in WWII, and afterwards murdered by the Germans on the premises of the ghetto and in German death camps. We did not have time to see Podgórze, the site of the former Ghetto. I said goodbye to David and boarded a tram back to old square. Noor was feeling better when I got back , but we still decided to stay in and ordered asian take-out from a nearby restaurant. The food was superb. I wish I remembered the name of the place because it really was that good. The next morning, we had hired a private car to take us to Auschwitz. Nothing can quite prepare you for the visit. On the way, as we were crossing the countryside, I was reminded of the scene in Schindler's list where a local kid makes a kill sign when the cattle train with jews on board trundles by. I did not see too many of the exhibits because I had Noor with me. She and I stepped out and walked around for a bit. After Auschwitz, we went to Birkenau where the open fields appeared very desolate. There was a farmer going about his business on his tractor just outside the camp. It seemed so incongruous and surreal. There are no words that can do justice to the camp. Suffice it to say, it was sobering. Back in Krakow in the afternoon, we went for lunch again to the same place where we had lunch the day before. Afterwards, we all walked back to the old square and wandered around taking pictures. It was a cloudy day, but the architecture still seemed very much alive. We had an early night, and the next morning flew back to Gothenburg. Krakow left quite an impression on us. The city seemed real, alive, historical, and somehow completely non-touristy. We absolutely loved it. It has made me want to wander the rest of Poland.